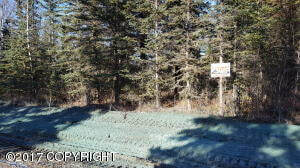 DESCRIPTION: 1.38 acre building lot in Kasilof on the corner of Sandwick and Leigh. Gas & Electric are adjacent to site. DRIVING DIRECTIONS: Sterling Highway south to MP 108.75, turn on K-Beach Road and go to MP 1.5. Turn left on Sandwick, property is on the corner of Sandwick and Leigh. Look for sign.